You may hear regular people talking about kidney and bladder infections in the same breath. The point is, though the conditions are somewhat elated, there is a significant amount of difference between the two. Kidney infections differ from infections of the bladder in a number of ways. Take a look at the important differences in the two conditions. Bladder infections usually affect the urethra, the narrow tube that transports the urine. It is also called cystitis which stands for an inflammation. However, a kidney infection refers to an inflammation or an infection of the kidney. It is a rare condition and not commonly found in many individuals. The symptoms of bladder infection make it easily identifiable. For instance, when a person has cystitis, urination becomes painful. The person needs to urinate more frequently. There is an increased tendency to urinate at night (nocturia) and the patient may have a pain around the lower pubic area. Some patients also complain of blood in the urine. In rare cases, the patient may also suffer from mild fever and foul smelling urine. All the above symptoms may be present in the person who has a kidney infection. A patient with an infection in the kidney will usually have acute or chronic pain around lower back area. The patient will have very high fever, chills, nausea and an upset stomach. He may either need to urinate more frequently, or not be able to urinate at all. Interestingly, more women suffer from bladder infections compared to men. Some people believe that the reason is that women have a shorter urethra, which makes them more susceptible to bladder infections. No such distinctions have been noticed in case of kidney infections. Bladder infections are usually caused by bacteria that are transported from the digestive tract to the urinary system. The most common of these is the E coli bacteria. A kidney infection usually takes place when a bladder infection gets out of hand or is left untreated for some time. Kidney infections are more likely in people who have diabetes, cancer, kidney stones or abnormalities in the structure of the urinary tract. Both the conditions are treated by antibiotics. However, you should be at rest for at least 2 weeks when you have a kidney infection. There is no such stipulation for a bladder infection. 3. Bladder infections are caused by E coli bacteria present in the digestive tract. A kidney infection is caused by a chronic or acute bladder infection that is left untreated. 4. Kidney patients are usually advised rest for a period of at least two weeks, there is no such stipulation for bladder infections. Purpa Mukherjee. 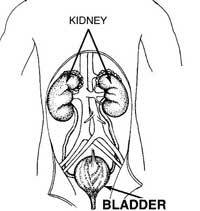 "Difference Between Bladder and Kidney infection." DifferenceBetween.net. September 25, 2009 < http://www.differencebetween.net/science/health/difference-between-bladder-and-kidney-infection/ >.